In a fascinating bit of analysis, Sky Sports pundits Gary Neville and Jamie Carragher have discussed Man Utd’s Anthony Martial. 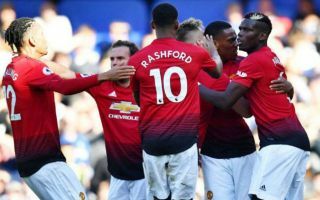 The 22-year-old has continued to split opinion having struggled throughout Jose Mourinho’s tenure to cement his place in the starting line-up. He’s bagged five goals in 11 outings so far this season, showcasing some consistency and quality in his most recent performances to suggest that he could be making a key breakthrough. However, as seen in the video below, Carragher has firstly questioned whether or not he does enough for Man Utd when he isn’t scoring goals as he can either put in a Man of the Match performance or be entirely anonymous without finding that crucial middle ground. Neville agreed with his fellow pundit, and brought up a crucial statistic that arguably goes some way to explaining a major flaw in Martial’s game. Compared to other wingers in the Premier League, particularly when looking at Sadio Mane and Eden Hazard, Martial’s distance covered per 90 minutes is almost 2km less than his rivals which simply isn’t good enough. That therefore strengthens the point Carragher was making about not doing enough off the ball to worry defenders, while Neville also added in the same segment that he remains undecided on Martial due to his inconsistency. As noted by Sky Sports, the Frenchman still has question marks lingering over his long-term future at Old Trafford, and so with these ongoing concerns, it’s bound to be something that Jose Mourinho is aware of. “If he doesn’t score, what does he actually bring to the game?”@Carra23 and @GNev2 compare Anthony Martial to wingers such as Sadio Mane and Eden Hazard.